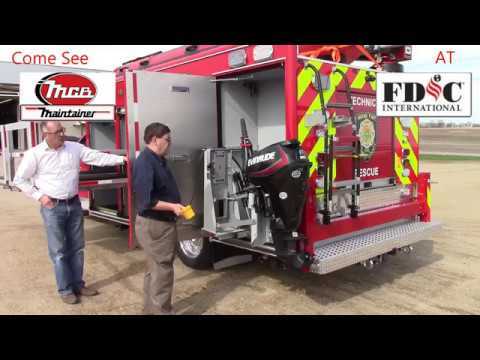 SEE THE NEW TEASER VIDEO FOR FDIC! Maintainer Custom Bodies will launch a brand new product for the fire industry at FDIC 2017. The exhibit hall will be open April 27-29 in the Indiana Convention Center in Indianapolis. MCB will display a brand new 15' Walk-Around rescue body mounted on a 2107 Ford F550 Chassis. The difference with this rescue will be evident immediately. This rescue will feature Maintainer's new EH4520 electric-hydraulic crane with 20' reach. "It's not just a crane," said MCB National Sales Manager Tom Leckband. "There are other features associated with this product that will make it a must-have for fire and rescue departments." MCB thanks Miami Township (OH) Fire & EMS for purchasing this rescue and allowing us to show it off at FDIC.Come to BOOTH #4749 to learn more! MCB will also bring back it's miniature rescue cutaway, so attendees can learn more about the advantages of adding MCB emergency vehicles to your fleet. More info on the show can be found at www.fdic.com.